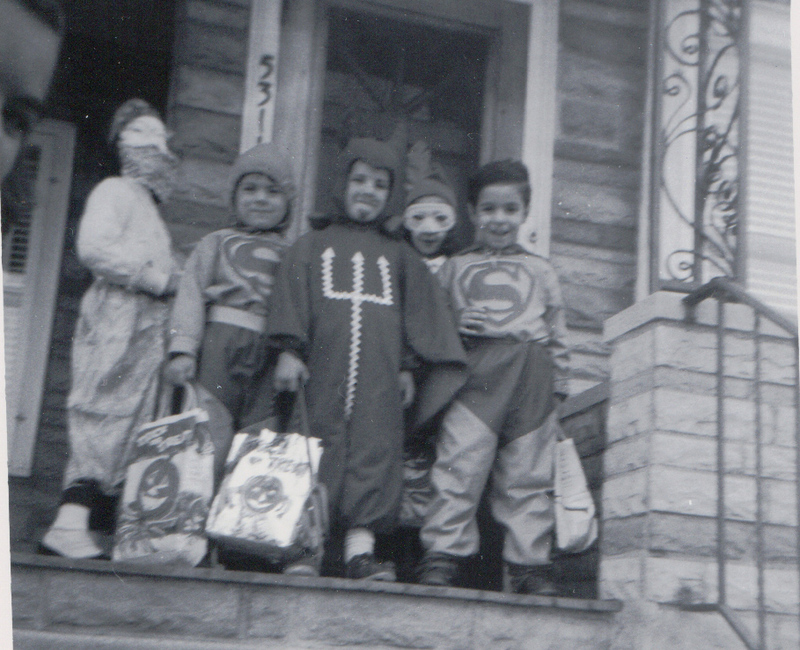 Researching Urban-Dwelling Ancestors: Trick or Treat? Happy (almost) Halloween, Everyone! Costume making, party planning, pumpkin carving – it has been a busy few weeks around here! I love sharing these traditions with my family and can’t help but think of how Halloween traditions have simultaneously evolved and endured over generations. photo from personal files of author. May not be used with out permission. How priceless is this Halloween photo from one of our family albums?! It also holds a great deal genealogical of value (FAN Club, house number and more!) too. But today, I want to write about a topic that has been on my mind a lot lately. Ironically, it was discussed on the FamilySearch Blog just yesterday. It is a truth I am learning, so I do not consider myself an expert, but here it is: Genealogy research in urban environments looks a lot different from genealogy research in small town or rural America. As mentioned in previous posts, I am currently working my way through Val Greenwood’s book, The Researcher’s Guide to American Genealogy and I recently attended the BCG Lecture Series for the Family History Library. These educational experiences only reiterated to me this contrast between urban and rural genealogy. In fact, I buttonholed Cook County research expert, Jeanne Larzalere Bloom after the Conference to ask her about this very topic. Is it just me, or does anyone else feel a little jealous when reading a case study in which the researcher uses negative research to correctly identify one individual out of maybe five others with the same name? Juxtapose this with urban research where scores of people may share a common name. For example, I have been researching one of my earliest known Irish immigrant ancestors for some time now. He is the key to a great deal of information on the family tree and the origin of a number of genealogical mysteries as well. His name? Michael Kelly. His occupation? Laborer. How on earth do I tell my Michael Kelly apart from the dozens of others with the same name living in Chicago at the same time? Though not long ago I considered this to be too daunting a task to even attempt, I have made good progress in recent months. I’m learning it takes work, but it doesn’t have to be impossible. In the past as well as today, people move into and out of cities frequently. Even individuals who lived in a city for all or most of their life often changed addresses multiple times . This is in sharp contrast to families in rural areas which often lived on the same plot of land for generations. The example of my ancestor holds true here as well. Except for several years in the 1910s where my Michael Kelly stayed at one address, the guy moved constantly. This has been one of my biggest challenges to my proving I am following the correct person. If you are researching in a large city, chances are you have non-English speaking, immigrant and/or illiterate ancestors in your family line. As a result, your ancestor’s name may be grossly misspelled in the records documented by those with little familiarity with your ancestor’s foreign language, accent or traditional name-spelling . Furthermore, your ancestor may have gone by a number of different names in an attempt to assimilate into American culture. This certainly necessitates a measure of creativity on the researcher’s part when using the old search box feature. Genealogists in rural communities appear to rely heavily on land records. Yet, for those of us searching our urban dwelling ancestors, we often find they owned no property . The Rent or Own column on census records can provide a clue as to whether or not this is the case. Even if you think your ancestor owned property, you may have quite the task ahead of you. I can’t speak for other large cities, but I understand that when it comes to Chicago, the process involved in finding land and property records can be something of a nightmare  – not that that should keep us from trying. Just know what you might be in for. A lack of property often translates to a lack of probate records, as well . Many genealogists consider probate records to be among the most valuable record sets available thanks to their ability to define relationships. Unfortunately, this is one valuable source we may at times have to do without when researching in cities. Despite these challenges, urban genealogy research is not a completely uphill battle. Here are some of the perks of having city-dwelling ancestors. “In big cities . . . it is much more likely that urban ancestors appeared in city directories and that those directories still exist” wrote Duncan Kuehn on the FamilySearch Blog . Even when you have an ancestor with a common name, city directories can be key to identifying that ancestor. There is a fantastic article on how to use city directories on the BCG Website. By knowing how to use them, you can often identify relationships, find employment records, identifying neighbors, understand address changes, and identify approximate dates of death . Though the city which your ancestor called home may have held a number of individuals with the same name, your ancestor’s immediate community may have held far fewer of them than you might think. Going back to my Michael Kelly example, I found that this ancestor of mine moved frequently, yes; But he always moved within a very small geographic region of what today is considered the near North Side/Magnificent Mile neighborhood, near Holy Name Cathedral where records show he attended church. Therefore, I can conclude that it is unlikely the person I find with the same name in the South Side Bridgeport neighborhood who attended Old St. Pat’s is the same person. The fact is, most large cities are just groups of smaller neighborhoods. So, if we learn the neighborhood, we will likely learn more about our ancestor. Speaking of church records, urban church records are much more likely to have been preserved than rural church records , and many of them are digitized online. I personally have had good luck searching the Chicago Catholic Church records online at FamilySearch. 3. Newspapers – The same holds true for newspapers. It seems to me that large city newspapers are much more likely to be digitized and conveniently searchable than rural newspapers with small readership numbers. Even if you think your ancestor wouldn’t have been noteworthy enough to be mentioned in a newspaper article, you may find record of them in the classified ads . If you have comparatively recent immigrant ancestors (generally speaking, post-1900 records contain more information than older documents) in your family line (which again, is fairly likely if you are searching in a large city), immigration and naturalization records can provide invaluable genealogical information such as town of origin, names of closest living relatives and more. Generally speaking, city cemetery records are more organized and better preserved than rural cemetery records . You may not find a published book or reputable website on genealogy research for a small county America, but you are likely to find excellent city-specific research guides to America’s cities. I’ve got Loretto Dennis Szucs book, Chicago and Cook County: A Guide to Research on my current wishlist and I wrote about some of my old Chicago genealogy standbys here. A number of individuals in my family tree worked for the Chicago Police Department and for the Chicago Surface Lines. Both of these agencies have surviving original records, as well as numerous related secondary sources just waiting to be investigated. The same is true for other large city agencies and corporations as well . You may be surprised what employment records you find surviving in America’s cities. So, there you have it. Have you noticed any other differences between research in large cities versus small towns or rural areas? Do you prefer one over the other? Do you know of any good resources on genealogy research in large cities or have any tips you would like to share?! Leave a comment or shoot me an email! I would love to hear from you! Duncan Kuehn, “Researching Your Ancestors from Large Cities,” FamilySearch Blog, 26 Oct 2015 (https://familysearch.org/blog/en/researching-ancestors-large-cities/ : Accessed 27 Oct 2015). Val D. Greenwood, The Researcher’s Guide to American Genealogy, 3d ed. (Baltimore: Genealogical Publishing Col, 2000), 310-311. Kathleen W. Hinckley, “Analyzing City Directories,” Online Article citing OnBoard 2 (May 1996): 16, (http://www.bcgcertification.org/skillbuilders/skbld965.html : Accessed 27 Oct 2015).